Workers at the Hanford Nuclear Reservation in southeastern Washington state were told to take cover for several hours today when steam was seen escaping from a tunnel where radioactive waste is being stored. The take-cover order was lifted at about 12:15 p.m. PT when inspectors confirmed that there was no radiological release from Tunnel 2 at Hanford’s Plutonium Uranium Extraction facility, or PUREX, the U.S. Department of Energy’s Richland Operations Office reported in an update. 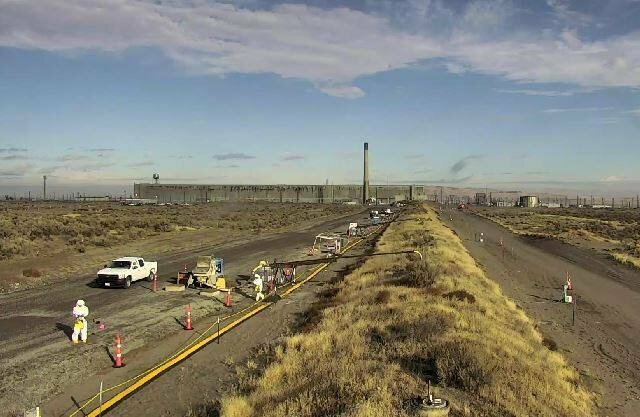 For the past few weeks, Hanford workers have been filling the 1,688-foot-long tunnel with thousands of cubic yards of grout to guard against the tunnel’s collapse. The tunnel, which dates back to 1964, houses a set of 28 rail cars that contain contaminated equipment. The last rail car was placed inside in 1996. This entry was posted in GeekWire and tagged Environment, Hanford, Nuclear, Radiation, Science. Bookmark the permalink.